Green Screen Digital Photo Booth!!! 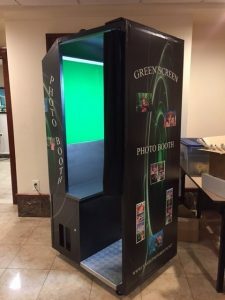 Rent one of our very own Green Screen Photo Booth for your event today! Our green screen photo booths are customizable completely. That means, we can customize or brand the photo booth with wrapping. We can customize the experience with a sign on top of the photo booth. Also, we can customize the picture in ANY WAY you would like. For instance, if you want a photo strip with only two photos and a logo, we can do it. If you want a photo within a larger photo, our green screen digital photo booth can be customized to fit this format. 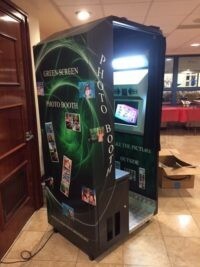 We can customize the photo booth in virtually every way! Also, the background of each photo can be customized using our green screen technology during the photo booth experience. That means that the person taking the photo can customize each photo with a different background. This type of technology does not exist on any other photo booths! See the photo to the left for an example. The first photo has a red car in the background, the second photo has a white car in the background, the third photo has a las vegas background and the last photo is in the jungle! The possibilities are endless! If you have specific backgrounds you want your guests to choose from, we can do that too!! So the photo to the right shows the green screen photo booth with your custom wrapping. You can rent the photo booth with this design or create your own! Also a custom logo can be re designed and added to the photo strip the possibilities are absolutely endless! Since a new photo booth is the only photo booth on the market that is completely customizable in EVERY WAY!!! We can change the white border to a different color border. For instance, the border can be hot pink! Or, red, or green or even black. Also the photo to the left shows the green screen area of the photo booth. The green background works with our technology to bring you the ability to add a custom background to each photo. Contact classic photo booth about renting a green screen photo booth for your special event today! Finally we offer complimentary quotes and can answer any questions you have on this wonderful new green screen photo booth!